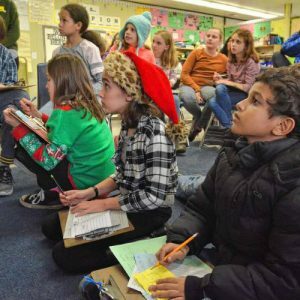 On an afternoon in late December, fifth-grade students at Fort River Elementary School gather around and write their rent checks. “Who can remind us what a memo is?” teacher Jonathan Severance asks the class. It’s not a real check — they’re elementary school students after all — but it looks like one. It’s all part of an initiative to give students a taste of the real world and teach them about money. To his point, research shows that as little as 7 percent of high school students can be considered financially literate, according to a 2015 Massachusetts report on financial literacy, and that Massachusetts is one of 12 states across the country that does not require schools to offer financial education courses to students.